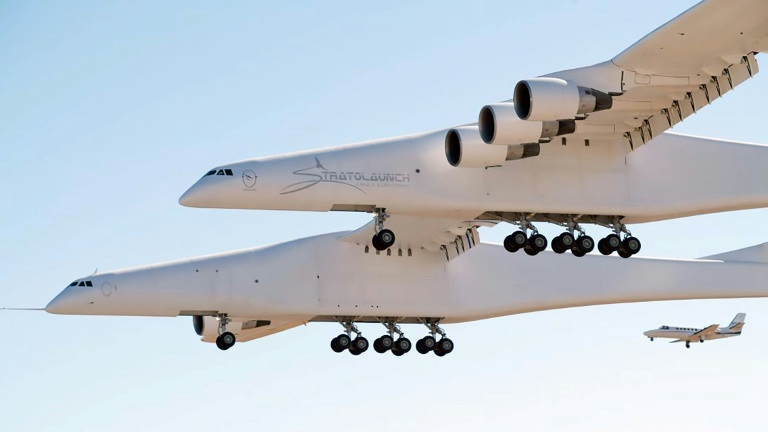 The world's largest airplane – a Stratolaunch behemoth with two fuselages and six Boeing 747 engines – made its first test flight on Saturday in California. The aircraft is so big its wing span is longer than a football field, or about 1.5 times that of an Airbus A380. Specifically, the wing span is 117 meters; that of an Airbus A380 is just under 80. The jet lifted off from Mojave Air and Space Port shortly before 7 a.m. local time Saturday and climbed into the desert sky 70 miles (112 kilometers) north of Los Angeles. The jet flew 2.5 hours, achieving a maximum speed of 189 mph (304 kph) and altitudes up to 17,000 feet (5,181 meters), the company said. But Allen died in October of last year, so the future of the company is uncertain. The previous wingspan leader was Howard Hughes' World War II-era eight-engine H-4 Hercules flying boat – nicknamed the Spruce Goose. Surviving in an aviation museum, it has an approximately 320-foot (97.5-meter) wingspan but is just under 219 feet (67 meters) long.